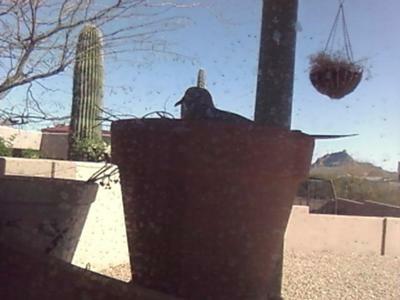 I was wondering why this dove was standing on the edge of one of my clay pot on the top shelf of my wooden planting table. It was Easter morning just a couple of days ago and I was thinking how lovely it was that I had a dove on Easter morning. Someone tall, (I'm too short to see up there!) saw an egg in the pot. That was when I realized that we had a nest! Thank goodness I had not cleaned out the old soil from the last planting season, so there is a nice base for a pretty nest. I was worried that night because it was surprisingly cold in Arizona and there was no Dove. After putting up with us in and out all day long, and being so patient with our Easter Egg hunt, I wondered why the nest seemed abandoned and was very worried about that egg. But the next morning a dove was back. I guess the Daddy now that I'm reading about this. When he left, I checked the nest and now there were two eggs! The nest is being faithfully tended at this point and I admit I am excited to see babies in a couple of weeks. I only hope all goes well. The nest is right next to my arcadia door and I can peek out to check on Mom and Dad whenever I want. My four year old grandson, who saw the first egg, is very excited and is getting telephone reports about the dove. In the meantime I am smoking (yes, you can throw rocks at me later!) on my front walkway so I don't disturb this little family. And my plans to replant the pots with my spring herbs will have to wait for a few weeks! I am posting a picture taken through the window as I did not want to frighten the bird by being outside. Please forgive the dirty window. It's been a rainy spring! Do nothing, the adults will protect the eggs. I need to protect my dove nest from the rain without disturbing the parents and both eggs! I'm afraid if I scare them away they'll abandon the babies. Help! 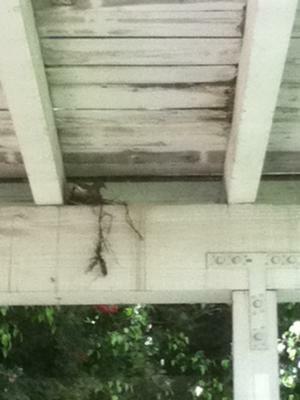 I have a dove nest on my patio also, but it is open to sun and rain which will come in a couple of days. 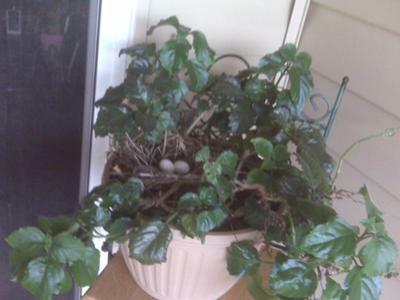 Any suggestions as to how to protect the nest without hurting or disturbing the bird? 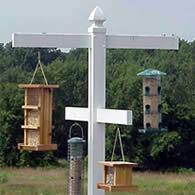 We have several Mourning Doves in our back yard, and have been feeding them for years. 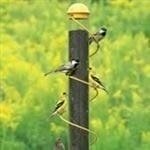 We have four feeders placed around the yard, and have seen quite an increase of these beautiful little creatures! This year, Spring has arrived with it's usual "community" of doves, with one pair, nesting on our back patio! We have two buckets on a shelf, that I normally plant flowers in, but before I had the chance to plant, we were surprised with the beginnings of a nest! 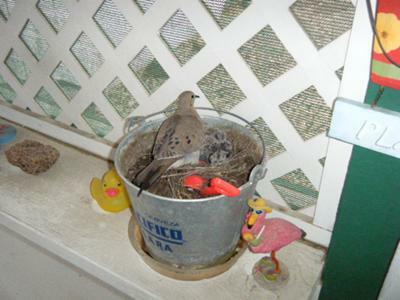 I decided to wait a few days, to see what happened, and, about three days later, I was amazed to see a dove (later determined to be "Dad"), sitting in the bucket! Within two days, two little eggs were comfortably tucked inside! So far, the pair have layed and hatched one brood successfully, and now we are blessed to see another two eggs in the nest! "Mom & Dad" are very protective of their nest, but do trust us to come & go through the Patio with ease...even letting us take an occasional peek! We have also been "allowed" to take a few pictures! We truly enjoy our new "tenants" and hope to see many happy returns, every Spring! 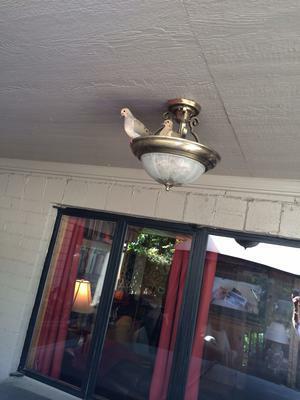 We have doves nesting on the ledge of our patio cover. Here are Paloma & Silvano. Silvano sits on the nest during the day and Paloma sits on the nest during the night. It was pretty amazing watching them build the nest. The only thing cooler is watching the changing of the guard when they change who's time it is to nest. 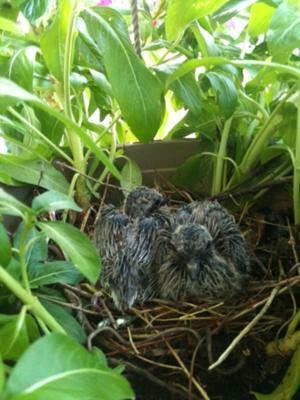 Two baby doves were born on my patio and yesterday took their first flight (which I got on video). Now the two adults and both babies are gone. I do hope they come back. They allowed me to photograph them, take videos, etc. They were only here a few weeks but I felt like a proud mamma. lol. I miss the babies already!!! 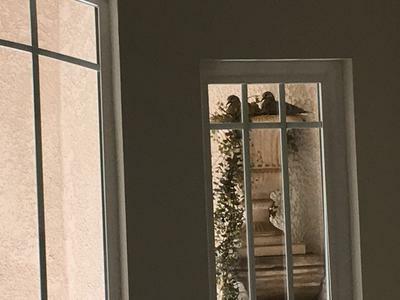 We had just returned to our California home after being gone a couple of months to discover a dove sitting on a nest on the fireplace ledge on our patio just about 3 feet from the door. We watched closely and carefully went in and out the this door so as not to alarm the dove. Until it got use to us, it would at times fly off the nest but always returned, this gave us the opportunity to peek at the nest and we noticed two eggs. Then one day my husband informed me that the babies had arrived, two little fuzz balls. I was surprised to see them with pin feathers so soon. One day I noticed that only one dove was involved is this hatching at this point because somehow it got a sore above its beak and we were able to identify it each time. I worried so about these babies, I read that if only one parent has the task of caring for the babies they are not usually successful. 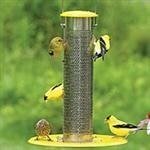 Just today I had the pleasure to witness the parent bird feeding the babies, what a precious sight this was. Then the parent at times would get out of the nest and sit for a while, I think it was resting because when it is in the nest the babies are trying to climb on it. (hey, maybe they scratched its nose). I hope and pray that the parent whether it be the mother or father can get these babies raised and out on their own and that they the parent will be ok after that. 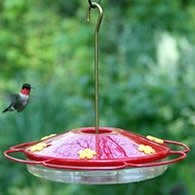 We were eating at night under are deck and we noticed on the eaves of it there was nest. We don't know much about birds, so we didn't know what type of bird's nest it was. The next day we saw a mourning dove sitting on the nest. We were so happy and watched it everyday. About a week later, we saw another dove sitting on the ground near below the nest. 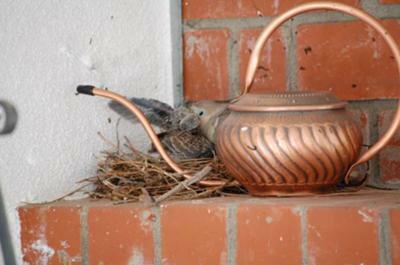 Then, the dove ON the nest left. When she came back, instead of sitting ON the nest, she sat right next to it. If you take a look at me I look like the typical man. But I’m a big animal lover and vegan. I had the Same experience twice. It’s heart breaking..
We had a pair of doves return this year to nest on our hanging pot of petunias...it was the 3rd time. Sadly on day 10 of her sitting a horrible thing happened. I heard a large noise on the front porch and ran to look. I was horrified! A large coopers hawk had attacked her and grabbed her by the neck. I ran to the front door and screamed and banged to scare him off and he had already seated to tear her up. He flew away quickly with her in his claws. I was brokenhearted. What a terrible thing to witness, I was helpless.....that was last night. Today the male has been sitting on our house calling and cooing for her. All I could do was cry as I cleaned up the mess on my porch, her blood and feathers. It all started one surprising cold day in March when it had snowed and a small sparrow was chirping on my patio, probably as confused as humans about why it was snowing in March. I decided he was hungry so I crumbled up some bread. I had a lavender plant out there, but she looked hardy so I left it there. The next day, the sparrow came back and I fed it again. I guess he told some of his friends as I got visitors every morning. Soon it became a habit to place bread crumbs out before I left for work. As if I needed one more thing to do before I left for work! One day I noticed the mourning doves working diligently building a nest in my lavender plant and then one day, just like that, she had two eggs in her nest. And just like the article stated, she appeared to never move from the basket. I was impressed with her dedication. The dove has since gotten use to me going out there as I put bread crumbs and water. Today was our first warm day and instead of sitting on the eggs, the dove was watching them. I'm guessing they are about to hatch. 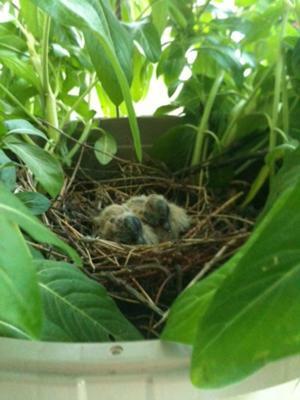 It's made me smile knowing that the doves felt they could nest right on my patio. Today I sat out on my deck enjoying the weather. I suppose it's the male dove that was watching the eggs during the daytime. He didn't seem to mind me either. Right around 5:00 p.m. I did happen to catch the switching of nesting duties. At first she laid beside the eggs so I thought maybe one had hatched. Later, I observed that she was seated back over the eggs. As an empty nester, I reflected on those years when I was expecting and how excited I was when I was having my baby. It was nice having a little family with me again. 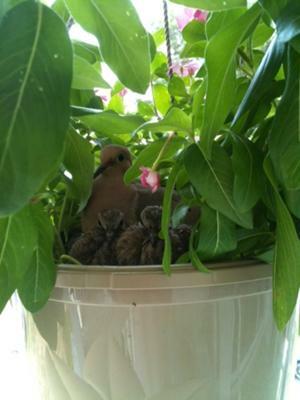 We had a nest in a hanging pot. There are 2 eggs in the pot.. initially the mother was there, then the dad. We worked in our yard one day, all day. 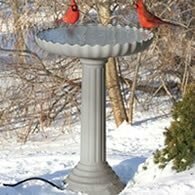 The doves have not returned in 3 days. Any info or suggestions. Since the first picture of my "Anticipated Guest," another egg was laid. I've been following the doves' story every day. Momma and Papa continue to allow me to water the plant so they've had complete privacy and protection from both sun and rain. I even managed to catch them changing shifts on more than one occasion. Was lucky enough to get a picture in mid flight! They've also allowed me to stand right nest to the plant and look at the chicks and get some close up pictures. Always under the watchful eye of the mother! Babies will be 2 weeks old on Aug 22/23 so I worry about their attempts to leave the nest. I'm on the second floor and hope they are successful. So far, they seem quite content to remain snug in the nest. Having several heavy rain/thunderstorms may have something to do with it! Here are the latest pictures! My Memorial Day plans took an unusual turn today. 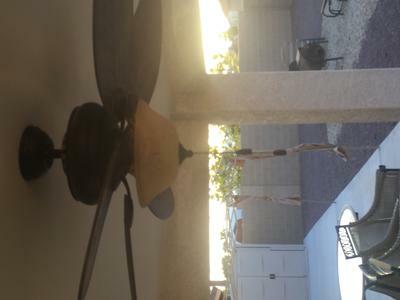 I had not been out to my patio in a few weeks due to our Arizona weather, when I got an unusual surprise. 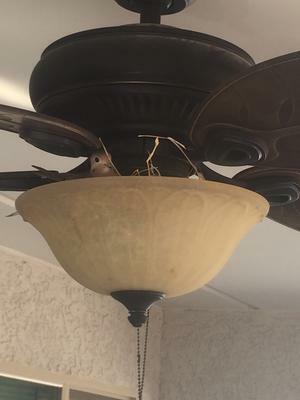 I went out to my patio this memorial weekend and started to turn the fan on when I saw that a dove had built a nest in the fan/light fixture. After some friendly harassment from my relatives regarding my housekeeping skills I began to seriously worry about the predicament. The dove was NOT in any mood to negotiate, and was not leaving. Apparently she had built a very comfortable nest and laid some eggs. Now, I am not a hard hearted person but I do like to sit outside on my patio some evenings with my fan and light on. With this nesting situation things were definitely problematic. Now I could just remove the light's dome fixture and dump the eggs, but then what would stop the dove from coming back looking for her young? Not to mention that I would feel like a heal for doing something that. So I decided I will share my patio with Mrs. Dove. For now, her and her little ones are safe from wind, rain, sunlight, and predators. 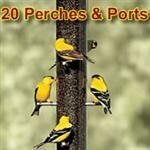 I will keep you posted on how the young ones do when they hatch and "hopefully" leave the nest. 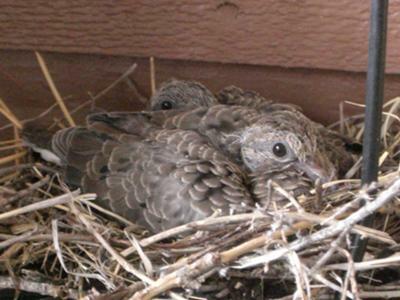 We have been fortunate enough to witness three clutches leaving the dove nest in our light fixture on our deck. The third clutch left the nest yesterday and this morning we are observing the mating procedure and nest building once again in the light fixture. It is a wonderful experience to witness and we are also fortunate to observe this nest activity from our family room as the light is just beyond the picture window in the family room. After the first clutch we removed the light shade and bulbs and covered the electrical sockets with duct tape. It is obvious they enjoy the human interaction and the only problem it has created for us is the ability to use the hot tub which is right below the nest. Oh, well, it is a hot summer and we do not need to use the hot tub at this time of year. 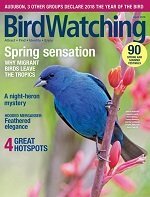 The things we do, and not do for our birds! Great story. Thanks for sharing. Each year morning doves make their nest in a vase 14 feet up on our front porch. 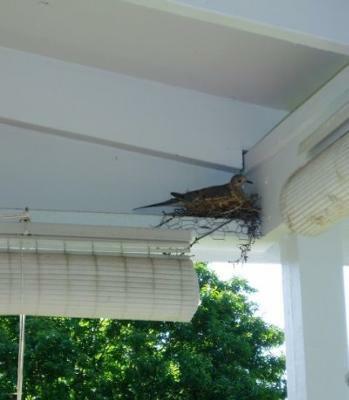 Several batches of nestlings are born each year and since the porch is covered, the doves are seldom attacked by blue jays or other birds and the nest is too high for other animals. 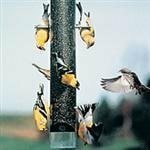 The picture shows the windows right next to the nest and when we wash the window, the birds watch us carefully but do not fly away. 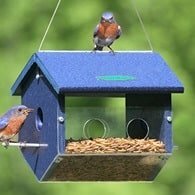 They provide a delightful view each year but we don't know if the same birds reuse the nest or if their offspring use it.